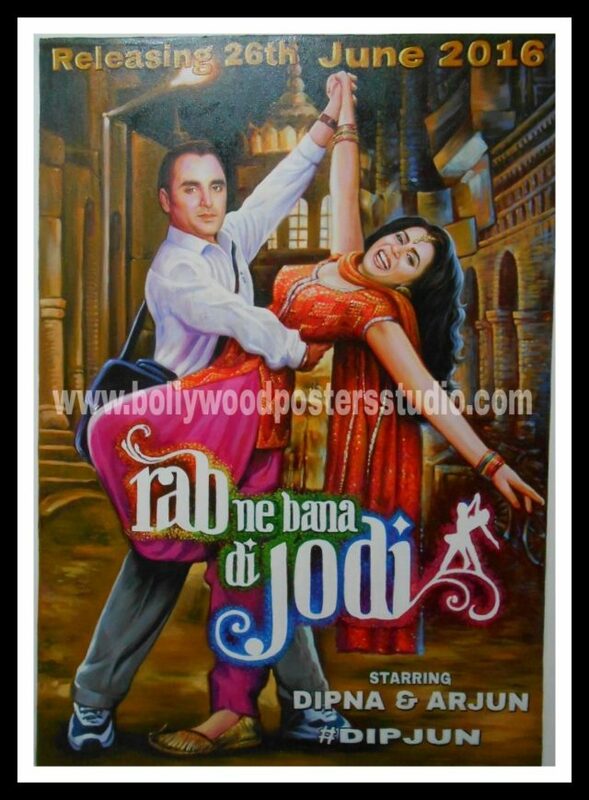 Are you looking for Custom bollywood posters save the date invitation ?. Bollywood posters studio offers wide range of custom bollywood posters save the date invitation . You had to just select your favourite movie which you want to paint and send it along with your hd photos at our email id : bollywoodpostersstudio@gmail.com . Or can contact us on +919022034923. Rest of work will be done by our expert team. Bollywood posters studio offers fully Custom Bollywood poster save the date invitation hand painted to suit your unique requirements. These magnificent works of art are created by the last few surviving Bollywood poster artists remaining in India. What you are seeing here is not a digitally created invite but a 100% hand painted Bollywood style wedding invitation cards. Painstakingly created on canvas using a blend of absolutely permanent oil colours, our Custom Bollywood poster save the date invitation come with a lifetime guarantee on colours. Our expert team comprising old school Bollywood movie poster artists can create virtually any Custom Bollywood poster save the date invitation on canvas to suit your unique needs. Simply select any Bollywood poster theme and we will design your very own Custom Bollywood poster for wedding cards based on the same.We will design a magnificent custom Bollywood poster for you on canvas that will become the master design of your Custom Bollywood poster save the date invitation . Once this master design is ready in hand painted format on canvas, we will take a high resolution digital photograph of your Custom Bollywood poster save the date invitation and send you the same at no additional cost! You can print this photograph on your unique Bollywood style wedding invitations in any quantity you desire. Addition to this, you can even enlarge this image into a massive banner that can be placed as a Bollywood wedding backdrop decoration.Highly accurate and realistic, our Custom Bollywood poster save the date invitation are unique works of art that you can treasure for a lifetime. Starting from a simple pencil sketch, you can see your Bollywood style wedding invitation cards come alive in oil colour in a step by step transformation. Don’t miss this once in a lifetime opportunity to get Custom Bollywood poster save the date invitation made for your special event – all from the comfort of your home! All you need to do is select a movie poster theme and your photos on our email. We will do the rest.We follow a thorough design process to ensure that all your Bollywood style wedding invitations will have the highest level of detailing and likeness possible. Accuracy and resemblance in faces is critical to the success of any Custom Bollywood poster save the date invitation and we strive to deliver absolute perfection in our work. The bollywood posers studio is trusted brand for creating best Custom Bollywood poster save the date invitation by actual traditional Bollywood poster artists. We offer the highest level of quality at a very fair price. Stop thinking ,go ahead and create your very own Custom Bollywood poster save the date invitation from bollywood posters studio. Let create the magic of bollywood on canvas.